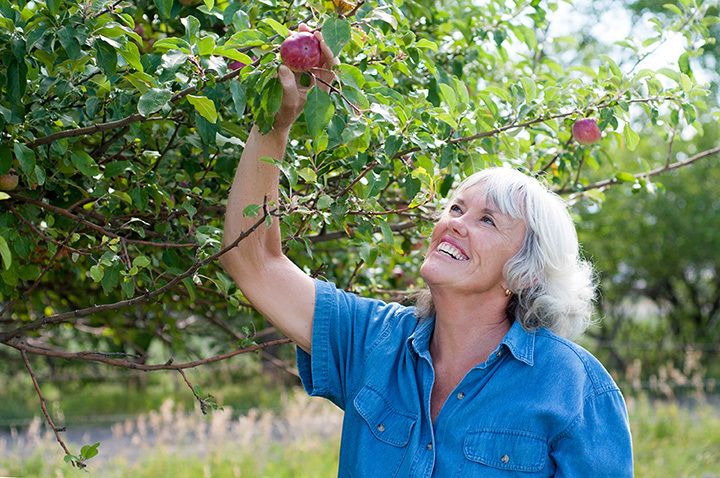 Apples grow well in Colorado’s rich soil and fresh air. Therefore there are a number of Colorado farms that produce delicious apples. The 10 farms listed below are all open to the public during apple-picking season, which is September and October. Find your favorite apple varieties, like Gala and Red Delicious apples, along with apple cider and other fall products at these farms, which are the 10 best apple picking spots in Colorado. Ya Ya Farm & Orchard is one of the most popular farms to pick apples in Colorado. This century-old farm uses natural and organic methods to grow crops. If you’re interested in apple picking, keep in mind that reservations are required. Once on the farm, pick some fresh heirloom apples, visit the farm animals, drink some cider and enjoy an apple cider donut while at Ya Ya Farm. Pick a variety of apples this fall at Happy Apple Farm. Early September is when the farm opens for pick-your-own apple picking. Enjoy Jonathan, Gala, Red and Golden Delicious apples all grown at Happy Apple Farm. While you’re there, pick some berries and pumpkins too. There is even a country store that offers fresh-baked pies and cobblers. Blackbridge Winery and Orchard Valley Farms is both a full-service winery and working farm. Orchard Valley Farms offers you-pick services year round. However visit during September to pick apples straight from the tree. Spend a day at Delicious Orchards picking your own apples, tasting different ciders and eating home cooked food from the cafe. There is no reservation required to pick apples at Delicious Orchards. Home of Big B’s juices and ciders, don’t leave without tasting some great ciders or purchase them inside the farm store that sells local and organic products. From September to the end of October, Camelot Farms is open seven days a week for apple picking and other farm activities. Enjoy organic produce along with fresh herbs and eggs. You can even press your own cider while at Camelot Farms. Near Glenwood Springs is a 75-year-old farm known as Orchard Creek Ranch. In September and October, head to Orchard Creek Ranch to pick organic, heirloom apples, such as Rome, Jonathan and Double Red Delicious apples. This farm also offers items for sale, such as apple cider, dried apple chips, apple cider vinegar and Applewood chips for barbecuing. Fruit Baskets Orchards is the premier you-pick farm in western Colorado. Find a variety of produce that is grown here, including an impressive variety of apples. If it’s ready to harvest, any crop on the farm is open for picking. Fruit Baskets Orchards is open from June to November during the weekend. Call ahead to schedule a visit during the week. Enjoy an afternoon of apple-picking at Jenkins Farms Apple Valley Orchard. Pick up a basket and cup of cider in the farm store before heading out the apple field. Pick from a variety of apple types such as Cortland, MacIntosh, Gala, Jonathan and Fortune. You won’t find pesticides or chemicals used to grow the produce at Nelms Farm. Best known for its you-pick apples and potatoes, this farm in Golden grew from a backyard orchard to a pick-your-own farm. Nelms Farm also has a beekeeper on site that does great demos on beekeeping too. This Grand Junction pick-your-own farm offers sun-ripened produce like apples, peaches, cherries and pears. Bolton’s Orchards and Farm Market offers some of your favorite apple varieties such as Gala and Jonagolds. You can visit the farm daily during the fall till mid-November.